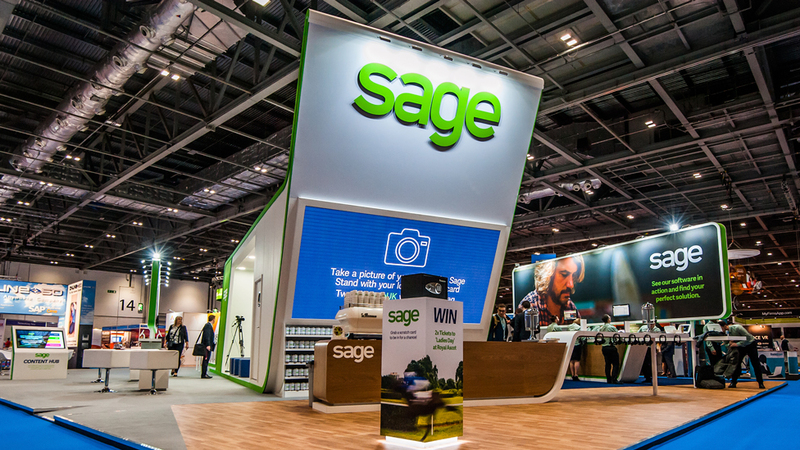 We took on board Sage’s recent brand refresh, their new colour palette and imagery and brought them to life with an innovative exhibition stand design and build. 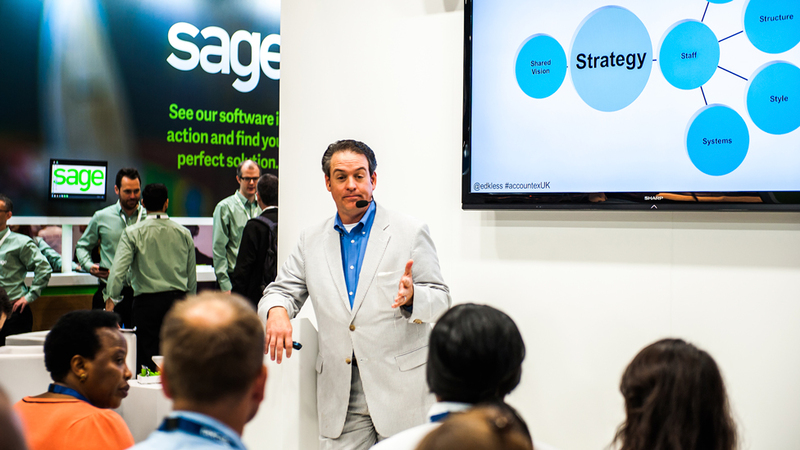 This is the 5th time we’ve worked with this client at Accountex, an event that attracts over 6,000 attendees annually. 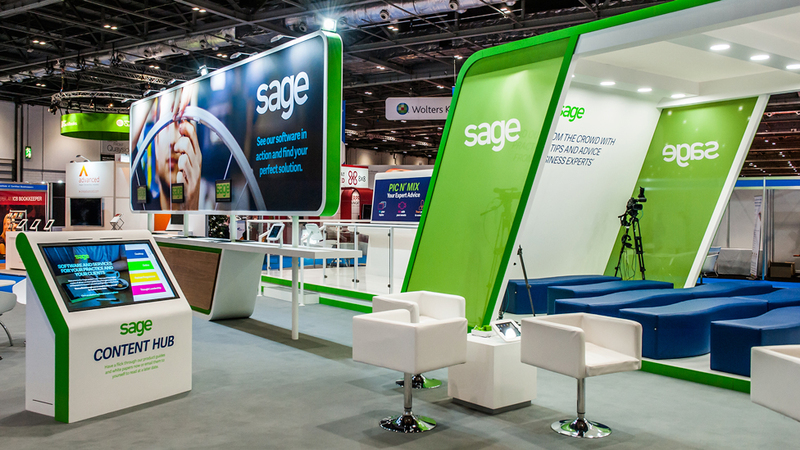 With every show we’ve gone from strength to strength: from a small 6x6m stand which we reused and adapted for the first two years, to a 200sqm double decker stand last year. This year, we delivered an imposing stand that became a beacon in the exhibition hall at 308sqm. 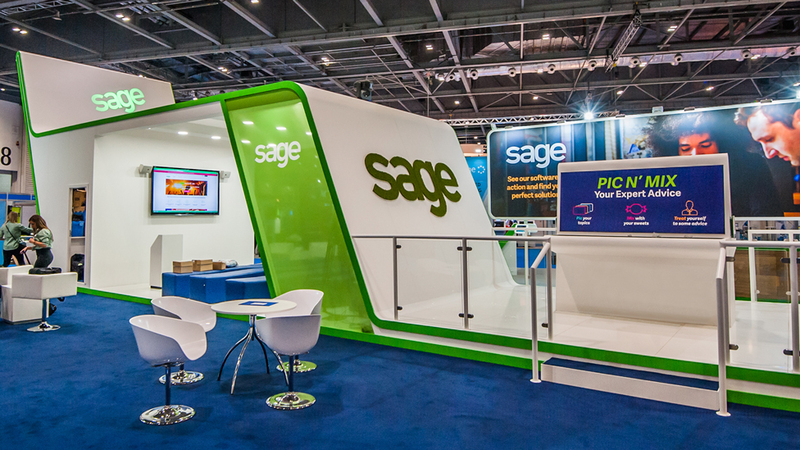 After the success of the previous year, it was important to have an exhibition design, and build, that had as much impact, despite it being a single decker design. It had to help present our client as thought leaders in their field, able to offer insightful advice in a welcoming environment. The exhibition stand design and build has a premium and at the same time inclusive feel. 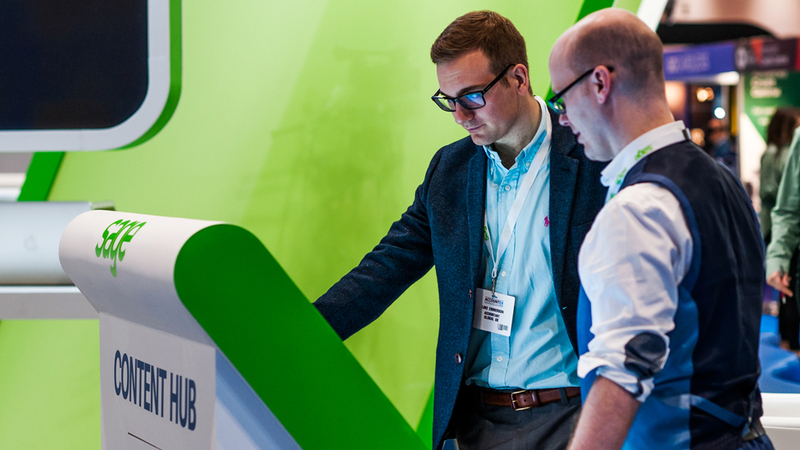 A wide variety of design, structural and content elements kept delegates informed and engaged, whilst retaining a clean and beautifully simple atmosphere. We designed and built an imposing 6m illuminated wall in the middle of the stand, creating a dominating appearance that delegates felt attracted to. Gobo lighting projected and moved the logo around, helping make the stand visible from even further within the exhibition hall. Whilst technology was still important, we made use of natural materials to help humanise the exhibition stand design and build, and contribute to the overall innovative flavour. 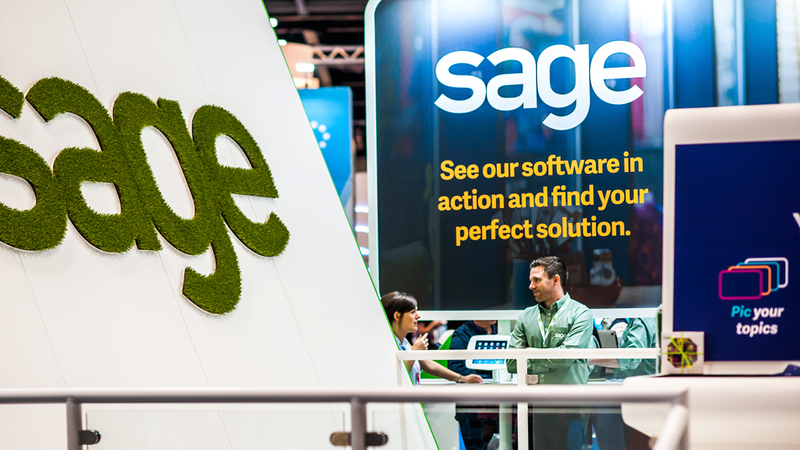 We introduced blue from Sage’s refreshed brand colours and timber to soften the environment. 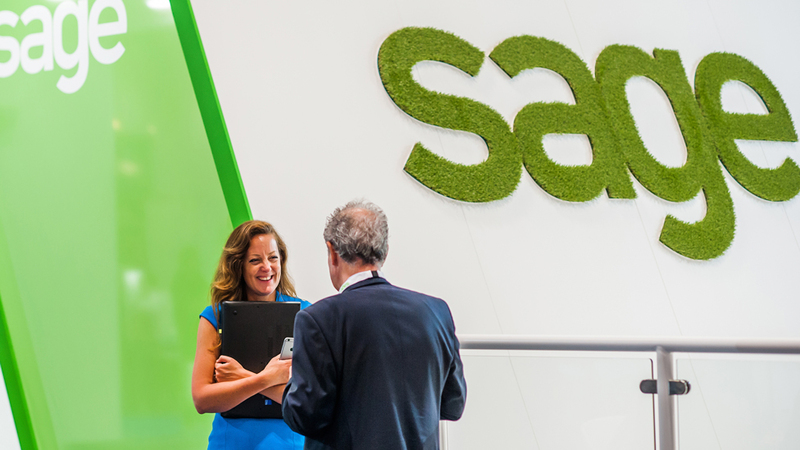 We even built a Sage logo in AstroTurf that turned into a playful element that generated curiosity amongst visitors. 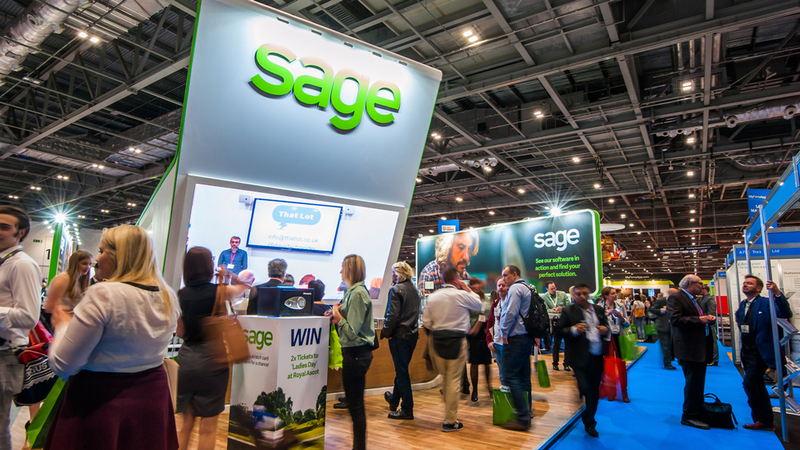 The stand was literature-free, helping Sage communicate their commitment to being a sustainable business, whilst it also served to further position our client as a technology leader. We custom built a content kiosk that included a 50in touch screen. 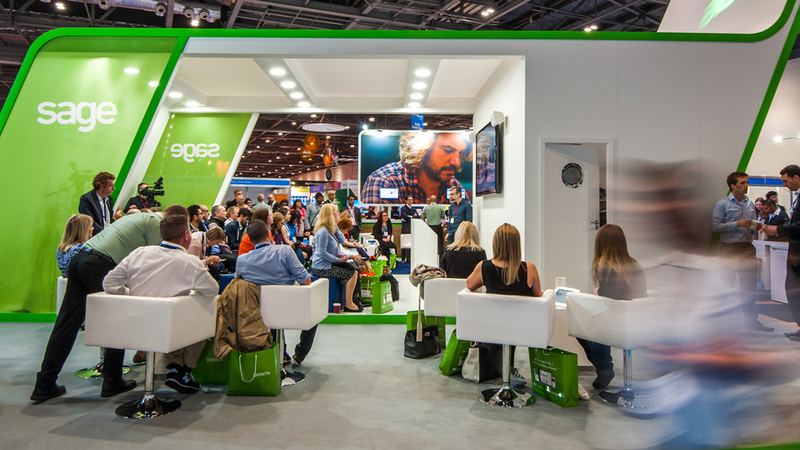 Visitors were able to view and browse through a huge range of insightful content, and could walk away with a fully-tailored digital content pack. 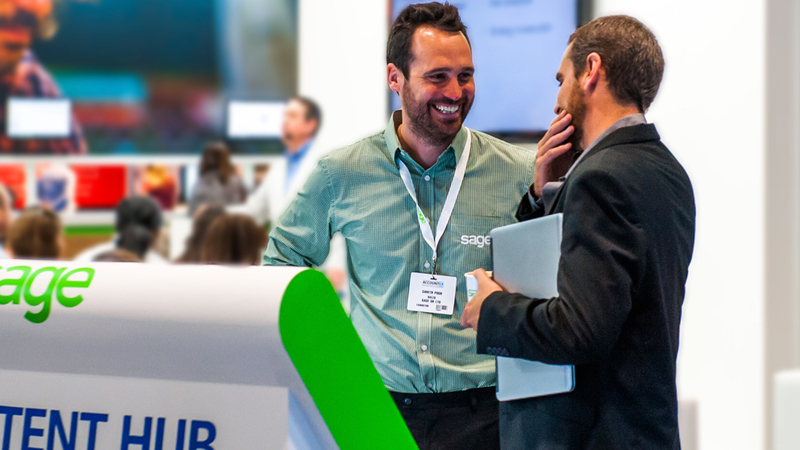 We programmed all the content and built in connectivity so that delegates could email themselves the insights they had just collected. 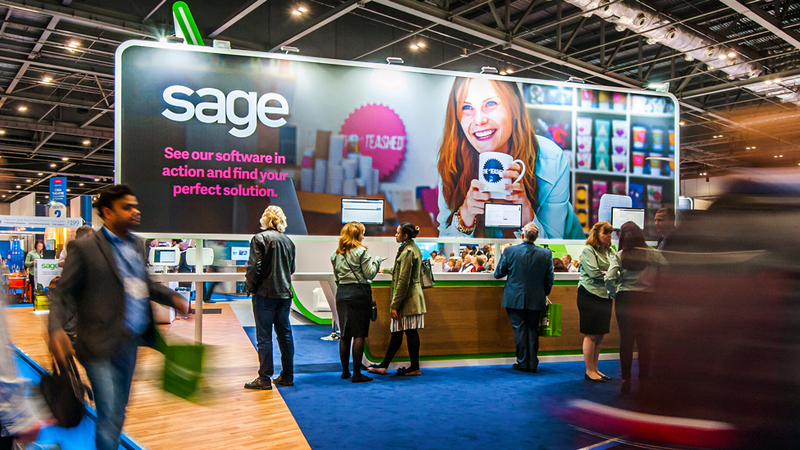 The software also included data capture, allowing Sage to follow up with their audience after the event. 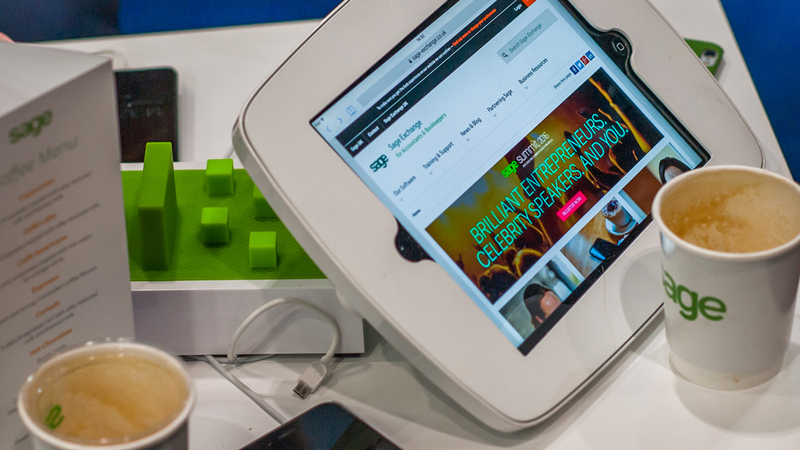 The exhibition stand design and build encourages networking with custom-built tables that include mobile phone charging points and iPads. A giant seamless screen was used to display impactful graphics. A precise logistics operation meant that a 1-ton structure made up of a TV screen, and a cantilevered wall seamlessly integrated within the design contributed to the natural flow of the curved angle structure. We also managed the full AV installation. Transparent printed walls, soft curves and dynamic angles softened the rigid structures. Curved benches in the seminar theatre gave the area a welcoming vibe, making it more personal and relaxed. Demo pods flanking round the side with integrated iPads and laptops. A raised theatre in the centre that helped generate curiosity and flow. 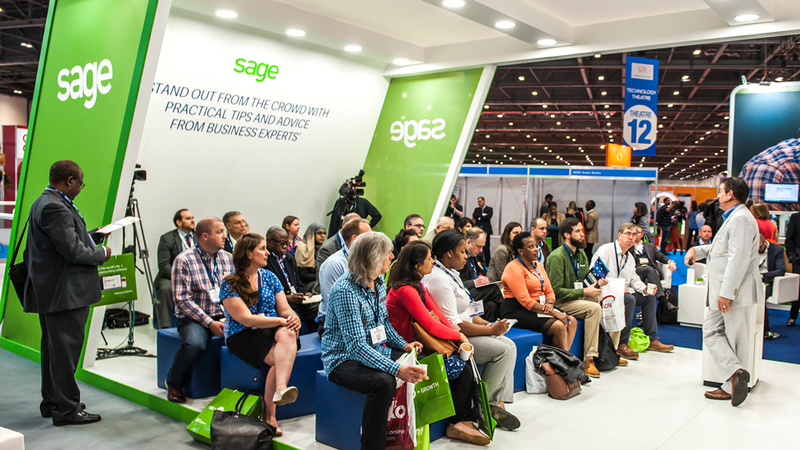 A 4m x 2m seamless LED screen and wireless headphones helped relay content when the seminar theatre was full. A live broadcast crew streamed live content to Sage’s YouTube channel. In between seminars we filled the screens with rolling animations, and we also included a relaxed coffee and juice bar with professional barista service. 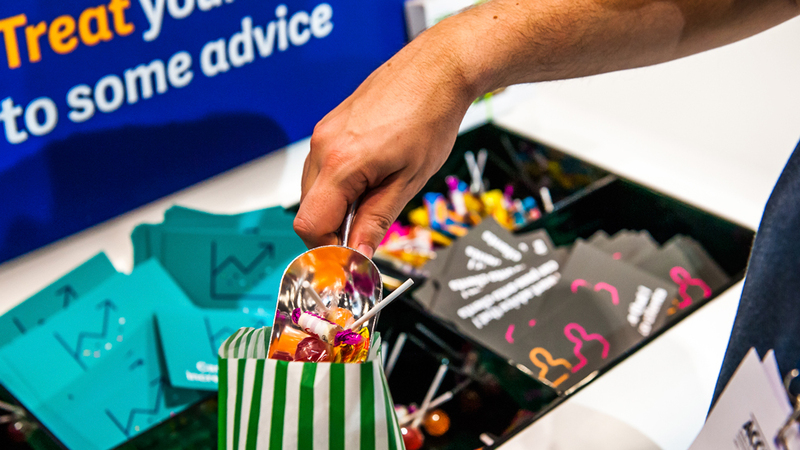 A “Pic n’ Mix” area allows visitors to make their own choice on the expert advice available: 12 bays on each side, with sweets and cards with a selection of topics to choose from. Proximity marketing content also helped attract visitors. Uploading content onto a hard drive within the stand allowed us to send notifications to the mobile devices of passers-by that had Bluetooth enabled. The messages were used to announce seminars (with content being updated on Day 1 and 2), encourage people to visit the “Pic n’ Mix” area or join the scratch card competition. We also set up a free Wi-fi connection: passers-by with Bluetooth enabled were notified by a pop-up message on their screen that included the day’s agenda and a link to connect to the free Wi-Fi. Another interactive activity came in the form of a competition. 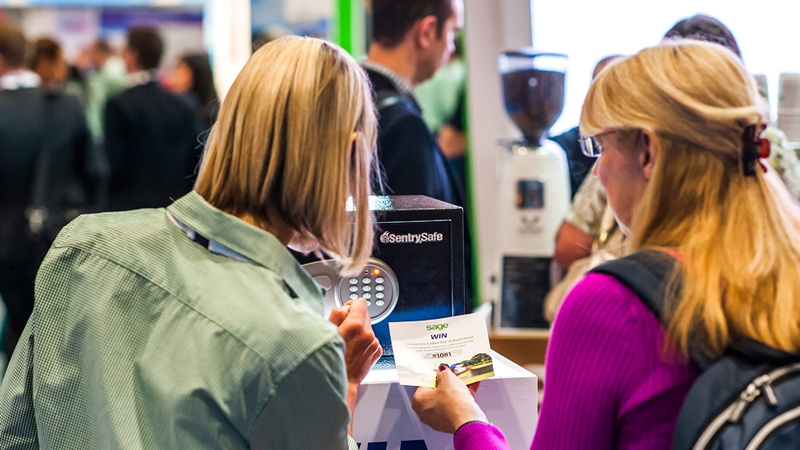 Delegates were offered a scratch card to reveal a code that may or may not open a fully working safe. The safe, positioned in a prominent area of the stand on top of a halo-illuminated podium, contained a pair of tickets to Ladies Day at Ascot. 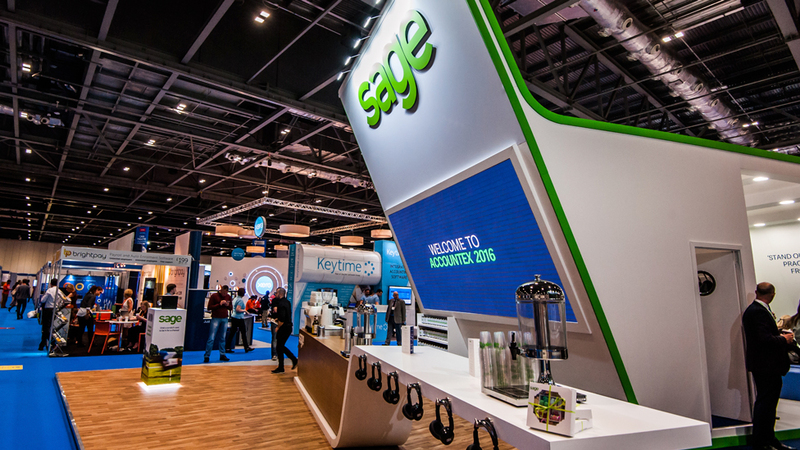 Following our client’s presence at Accountex, the stand has been adopted as best practice on application of the new brand. “Loved both the proximity marketing and content hub. 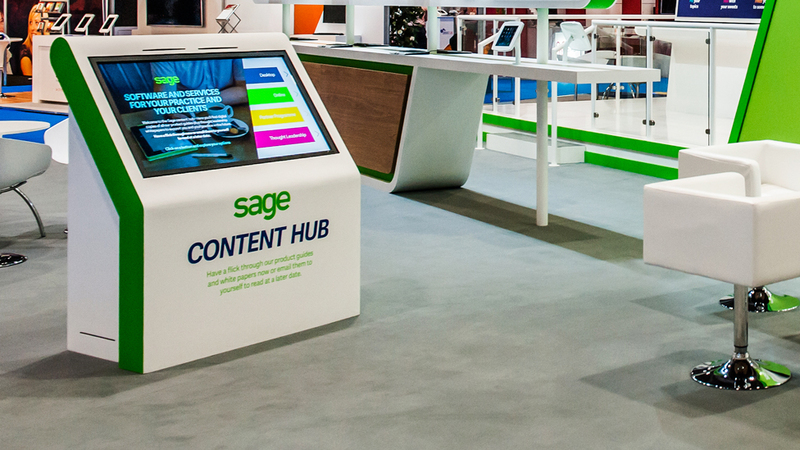 We had lots of feedback from Accountants on the content hub – with one of the visitors saying it was like magic, he “loved it” and it was the “best thing I’ve seen all day”.